Photo: T.H.Everitt; From the Estate of Gladys Cheetham, courtesy of The Harrison Weir Collection. 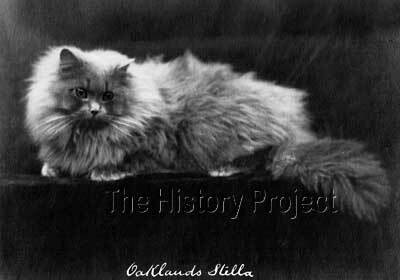 Until relatively recently, no connection had been made between the two Blue queens, 'Oaklands Stella', and 'Oaklands Sheila'; until that is, the sale of the photographs and breeders records from the Estate of Gladys Cheetham, who was the mistress of Oaklands Cattery from circa 1909 to 1914. And that did not take place until almost exactly 100 years later. 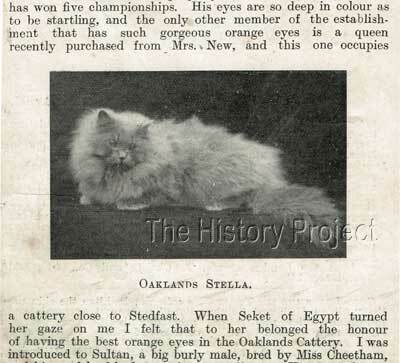 Stella was simply recognised as one of a string of beautifully presented typey Blue Persian queens, owned and campaigned by Miss Gladys Cheetham, in what was a meteoric rise to fame within the Fancy, with almost unparalleled success in the realm of Persian cats. But the tale of Stella's parentage, has unfolded a long-term mystery. She was born on 11th April, 1912, sired by 'Big Ben'(of Devonshire), a Blue Persian male from an old and much respected line of famous Blues. Big Ben's dam, was a grand-daughter of 'Ch. Patrick Blue', and the daughter of Miss Frances Simpson's own 'Bonnie Boy'. His sire, contains another line-breeding on Ch. Patrick Blue, and on a a tripling of his forebear 'Blue Ruin'. "Stella is a little cat, full of quality." So the implication is that 'Colquhoun' and 'Sheila' are one and the same cat. Whilst under the care and ownership of Miss Cheetham, she was 'Oaklands Sheila' but when under the care and ownership of Miss Adams, was renamed 'Colquhoun'! 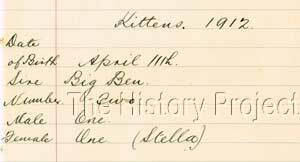 And as even further support for this premise, is the fact that Sheila was shown by Miss Cheetham in 1910, under that name, then there are no more show records for her until six months or more, AFTER she had produced the litter to Big Ben,in 1912. Then she resumes her colourful and successful show career, going on to win Best Cat in Show, and her Championship, once again with Miss Cheetham, and as 'Oaklands Sheila'1. Today, we find this changing of names difficult to understand, but at the time, most cats that changed hands were either re-registered upon transfer OR took on a secondary cattery name, hence the large number of dual names shown in the register and in brackets on so many pedigrees dating from this period and earlier. So it certainly very conceivable and highly likely that some sort of breeding arrangement was entered into, whereby Miss Adams was recorded as the temporary owner of 'Sheila' as 'Colquhoun' for the purpose of producing the litter, with Miss Cheetham claiming the female from the litter at a premium and having her named for her own cattery, as was the usual custom and practice, hence 'Oaklands Stella'. So now, instead of no pedigree behind 'Colquhoun', we can substitute the names of the parentage behind 'Sheila' which were 'The Gondelier' and 'The Princess of Orange'. Until this time, there were certainly no full siblings recorded, although the litter record above indicates that Stella had a brother born live. We could surmise that Miss Adams could have retained him or sold him, as if he had not survived, it would most certainly have been recorded. However, there are a good number of sire-siblings (Half brothers and sisters) recorded by 'Big Ben' but we will mention on two of note here for future reference. The first is a Blue male called 'Oaklands Bennie', a Black Persian male, born 19th June 1909. His dam must have been a Black, and we do know from older photos in the Cheetham Estate, that Miss Cheetham bred blacks even before she became known for her Blues. It even seems likely, that she had either owned, or greatly admired a well-bred Black male, named 'Earlsfield Black Prince', whose photo was found amongst her personal cattery documents. 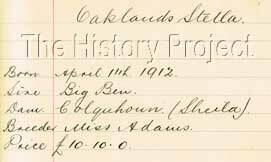 The second sire-sibling, was a famous son of Big Ben, 'Ch.Bluestone of Tilecote', who was born 1st May 1910, and who eventually became a successful export to the United States. Only one litter is recorded for Stella, born on 31st June, 1913, but that was sired by Ch. Oaklands Steadfast. This resulted in two kittens, one male (born dead), and one surviving female, named "Simile". The below portion of an article published in The Queen, The Ladies Newspaper in January 1914, includes a small version of the above studio photo of 'Oaklands Stella'. Breeders Records, Gunnersbury Lodge, Mill Hill Park Book, from the estate of Gladys Cheetham, courtesy of The Harrison Weir Collection. 'Miss Cheetham's Cattery at Oaklands, Brighouse', The Queen (The Ladies Newspaper), 28th February, 1914. Studio Photo by T.H.Everitt, from the Estate of Gladys Cheetham. All photos as per Sources and Credits given.